On Campus, Older Faculty Keep On Keepin' On : NPR Ed Many professors are postponing retirement, and colleges say it's hurting their efforts to cut costs. Ken Nickerson could have retired from his job as a professor of biological sciences at the University of Nebraska, Lincoln 10 years ago, when he turned 62. He could have retired five years ago, when the university offered faculty a year's salary to step down as part of a buyout to encourage more of them to leave. He could have retired last year, when, in yet another buyout offer, administrators dangled the equivalent of 90 percent of one full year's salary in front of faculty who would finally agree to go. After 40 years of doing research as well as teaching, "I want to find the answers to certain questions before I retire," he said. "I want to get those discoveries made, I want to get those publications out, and there's a pretty long list of them still." He has plenty of company around the faculty dining hall. "My Ph.D. adviser worked until he was about 77," Nickerson said. "One of my postdoc advisers was editor of the Journal of Biological Chemistry until he was 85. Another one is still active here at the University of Nebraska, and he must be 77. So there's a lot of inspiration to keep working." 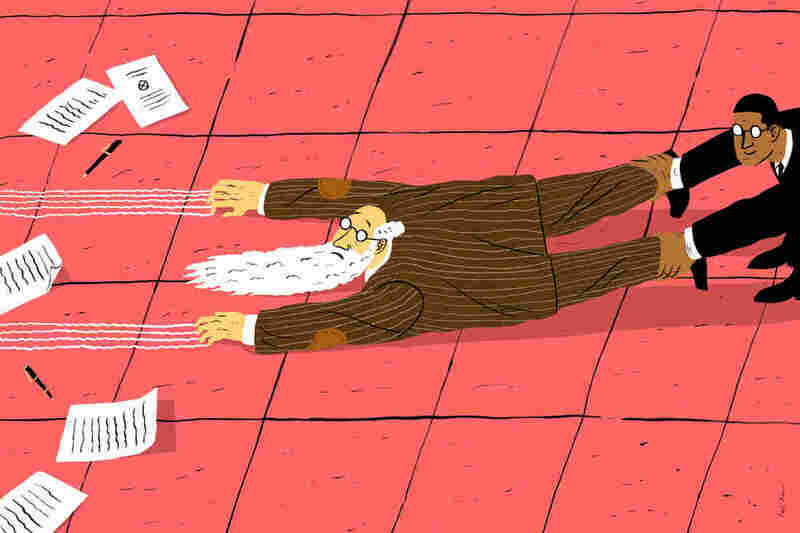 Protected by tenure that prevents them from being dismissed without cause, and with no mandatory retirement age, a significant proportion of university faculty isn't going anywhere. A third are 55 and older, compared with 20 percent of the rest of the workforce, according to the University of Iowa Center on Aging. And while 36 percent of all workers plan to put off their retirements beyond the age of 65, the proportion of university and college faculty who intend to delay stepping down is more than double that, the financial services company TIAA-CREF reports. Another study found that 60 percent of faculty planned to work past 70, and 15 percent to stay until they're 80. This dramatic trend foretells more than a future of campuses populated by white-haired professors in sensible shoes and tweed jackets with elbow patches. Universities say it's making it harder for them to cut costs and improve productivity exactly at a time when students and their families are balking at the high cost of a higher education. And when those students — not to mention politicians and business leaders — are expecting a better return on that investment, the institutions say the buildup of aging faculty leaves them less able to respond to changing demand for new kinds of majors, or to declining enrollments, and that it's also blocking younger Ph.D.s from entering the workforce. "Higher education on the one hand is confronting constraints and on the other hand confronting greater needs that have to be met," said Herman Berliner, who stepped down in August as provost at Hofstra University in Hempstead, N.Y., and now is dean of its business school. "Yet with faculty staying longer and longer, what you have is resources fixed in place, sometimes in areas where there is very little demand." Meanwhile, "in some cases some senior faculty simply may not be as effective in the role as they once were," said Paul Yakoboski, a senior economist with the TIAA-CREF Institute. "A certain degree of churn is healthy and productive [and brings in] fresh blood, fresh ideas, people up-to-date on teaching techniques and research techniques." Berliner has proposed the idea of a time limit on tenure of 30 or 35 years, after which faculty could be rehired on one-year contracts. That would give universities more flexibility to behave like private companies and make changes to their workforce in response to market changes. "I don't believe in an age cutoff, but to say that tenure goes on forever nowadays, that's not the way the system worked for a very long time before," when mandatory retirement still applied to academic faculty, he said. "It's an exceptionally difficult problem to deal with," he added. "Who's going to stand up and propose 35-year tenure?" That, he said, would put a university at a competitive disadvantage in hiring new faculty. Older university faculty have the same financial concerns about retirement as everyone else, and those whose retirement plans rely on 401(k) plans were particularly vulnerable to the economic downturn, said John Barnshaw, senior higher education researcher at the American Association of University Professors. More than 40 percent of faculty who plan to work past 65 told TIAA-CREF that one reason was financial insecurity. Making the matter worse, many institutions have scaled back or eliminated 401(k) contributions for their existing employees and post-retirement health care benefits to save money, compelling some retirement-age faculty to stick around even longer. "Faculty are not immune from the larger economic challenges that the U.S. and the larger economy face," said Barnshaw. "They maybe had planned to retire because they hit a certain financial threshold, but then they had a setback." Besides, he said, one real reason universities want their tenured faculty to leave is so they can be replaced by cheaper faculty who are not on track for tenure, and by part-time adjunct instructors, in the same way that private companies outsource their work to cut costs. The proportion of faculty who are part time has already climbed from 22 percent in 1969 to 67 percent today, according to the Association of Governing Boards of Universities and Colleges, meaning that the full-time tenured faculty who won't leave are already a much smaller proportion of the total than they used to be. Whatever their motives, universities are trying to dislodge their older faculty with buyouts like the ones at the University of Nebraska. A few faculty have begun to leave some public universities in states including Illinois, in part because of fears that their shares of massively underfunded state pensions will be at risk if they wait too long. Elsewhere, however, the buyout offers have been met with little interest. And "with positions being held longer and longer, the younger Ph.D.s we're turning out have limited job opportunities," Berliner said. When enrollment at Hofstra University's Maurice A. Deane School of Law fell by more than 32 percent in 2013, for instance, faculty there were offered two full years of salary to retire, Berliner said. Not a single one accepted. At the University of Nebraska, Lincoln, 79 out of 245 eligible faculty took the one-year's-salary buyout offer in 2010. Ken Nickerson was among the nearly 70 percent who turned it down, confident that he remains quite capable of doing what his job demands. "I can still publish papers, I can still participate in intellectual discussions with my graduate students," he said. In fact, 90 percent of faculty who planned to work past the typical retirement age, meaning the age at which people can begin collecting Social Security benefits, told TIAA-CREF it was because they found their jobs fulfilling and enjoyable, and 82 percent didn't see any good reason to stop. "You absolutely see that dynamic," said Yakoboski, of the TIAA-CREF Institute. "They're still actively engaged in their academic pursuits, both research and teaching, and see no need and have no desire to retire." They also bring institutional experience and research savvy, many older faculty say. "That's what I think I still represent," Nickerson said. The question for him now, he said, is "how long I'm intellectually capable of doing it. What I'm balancing is looking at how mentally sharp some of our recent professors are compared to what I am, and they're a lot quicker, there's no doubt about that. I can bring perspective, an historical viewpoint, and good judgment to questions, but I don't want to be occupying a space and a laboratory when I'm no longer capable of doing a job. That's probably going to come around in, I don't know, three or four years."